Everyone likes a good fight at Christmas don’t they? 1877: Wyoming Territory. The Union Pacific Railroad started running to the territory 10 years earlier. Yellowstone National Park was established five years after that. Stagecoach robberies still occur. The West is still Wild. There are riches under the earth, and not just gold. In step Edward Drinker Cope (fine moustache, small goatee) and Othniel Charles Marsh (large, untamed whiskery beard). 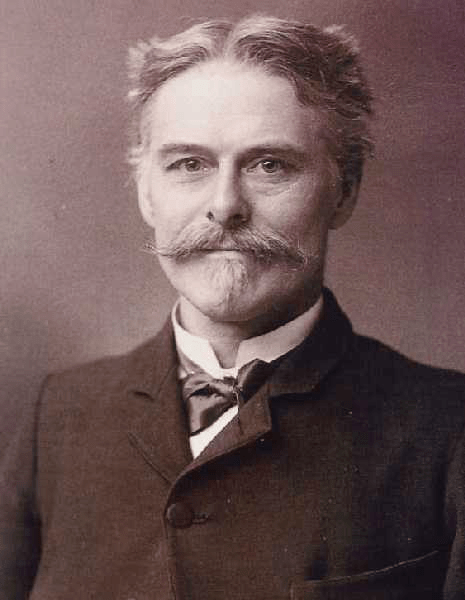 Cope was quick to anger, the son of a wealthy farming family, and an opponent of Darwin’s recent and controversial evolutionary theories. Marsh was methodical, had a poor father, but a very rich philanthropic uncle and supported Darwin’s theories. One was a gentleman, one a player. Both liked dinosaurs and both liked a fight. They did not like each other one little bit. In 1877 both were engaged in palaeontological adventures. After the discovery of massive bones embedded in rocks, Marsh and Cope both rushed to Wyoming and started digging. Other locals, keen to make a fast buck, contacted Marsh and Cope about their finds. In their haste to extract the fossils and discover creatures previously unknown to science, mines collapse, territory is staked out, bribes are distributed and new finds are kept secret. Marsh tries to keep Cope out the sites he’s discovered. In retaliation Cope employs ‘dinosaur rustlers’ to dig the bones out from under Marsh’s nose. Their employees switch sides and spy on the other in return for better conditions or better pay. It’s even possible that dynamite was employed to bury fossil sites to deny the other any chance of recovering them. 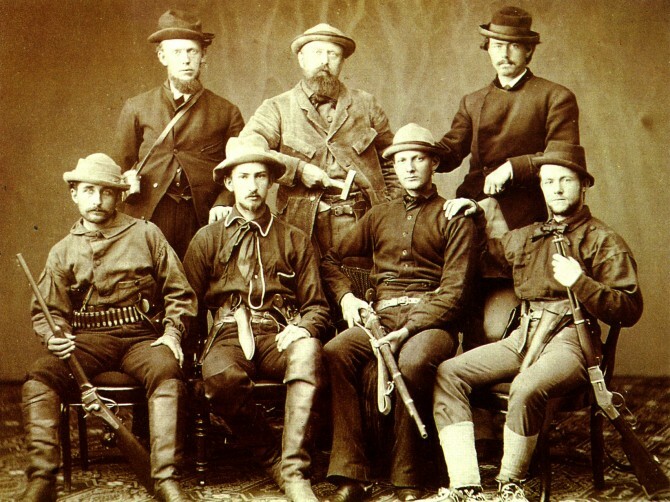 Marsh (back row and centre), surrounded by armed assistants for an1872 expedition. Train-car-loads of bones headed eastwards on the Union Pacific to their respective institutions where Marsh and Cope would spend the winters examining them and publishing their discoveries. But the fighting didn’t stop when they were safe in law-abiding Eastern States – there were reputations to be trashed. Both made mistakes. Cope reconstructed Elasmosaurus incorrectly. Marsh put the wrong skull on an Apatosaurus and called it a Brontosaurus. Each man’s error was gleefully publicised by the other. At one point, Cope tried to buy up all the copies of the paper in which his mistake had been highlighted. As the fighting continued, the war-chests were emptied. Both found themselves in much reduced circumstances in the 1890s. By the mid 1890s, the stories were fading, their reputations largely ruined, their beards wilting. 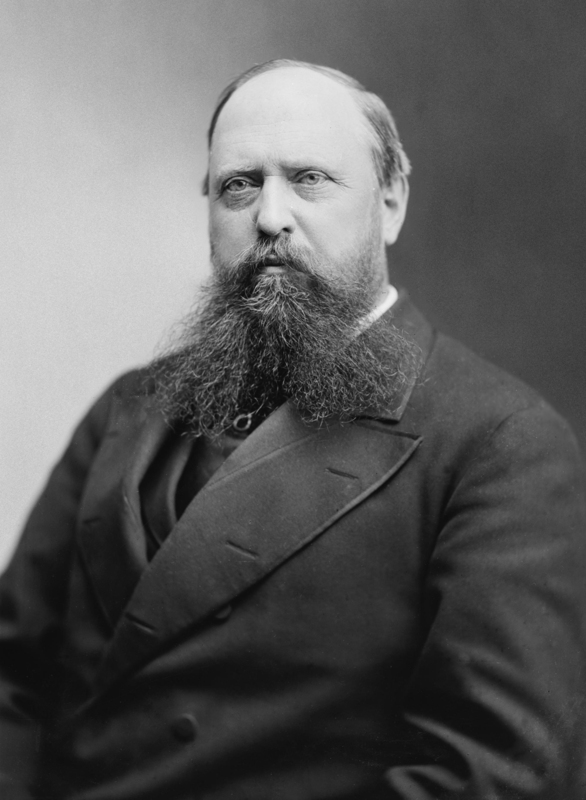 Cope died in 1897, leaving Marsh one final challenge. He donated his skull to science in order to measure the size of his brain, confident that upon his death Marsh’s brain would be found to be smaller and inferior. Marsh did not take up this final macabre bet. Out of the rivalry between Cope and Marsh emerged Stegosaurus, Triceratops, Diplodocus, Allosaurus and Apatosaurus, along with many others. 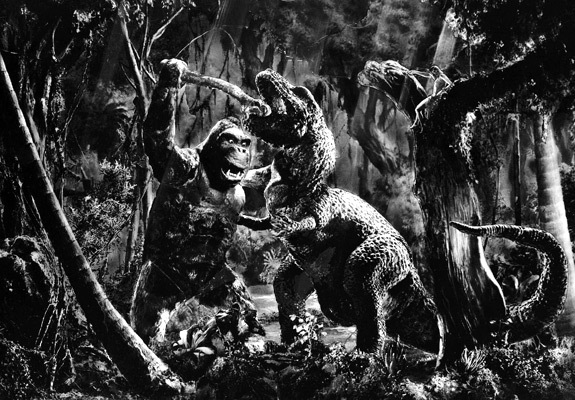 It only took another 36 years after Cope’s death before the real stars of the show were brought to life by Hollywood, starring in “King Kong” and engaging in their own battles against an oversized primate. Tags: Beards, Fossil hunting, history, palaeontology. Bookmark the permalink.